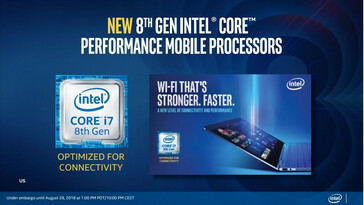 Laptops powered by the new performance mobile 8th Gen Intel® Core™ processors announced today are expected to ship from OEM and system manufacturers with protections for the security vulnerabilities commonly referred to as "Spectre", "Meltdown” and “L1TF”. These protections include a combination of the HW design changes we announced earlier this year as well as software and microcode updates. " 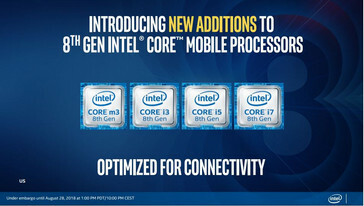 At a time when cramming 4 cores under a 15W TDP envelope was considered out of bounds, Intel announced the first 8th generation quad-core CPUs under the 'Kaby Lake-R' family around this time last year. 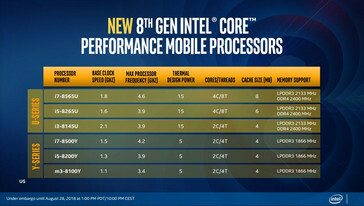 The performance of 'Kaby Lake-R' in most mainstream applications was well within reach of the more powerful 45W 7th generation 'Kaby Lake' chips and thus, were quickly lapped up by many laptop OEMs as they offered a perfect combination of power and portability without taking a toll on battery life. 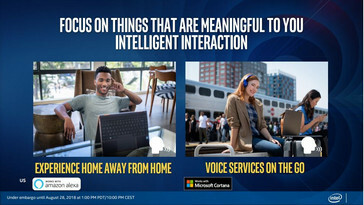 While today's announcement is not as revolutionary, Intel is building new improvements from the ground up with a stronger focus on connectivity, performance, and battery life. News about 'Whiskey Lake-U' and 'Amber Lake-Y' started showing up last month when a new Dell XPS 13 2-in-1 model featuring the Intel Core i7-8500Y was inadvertently leaked by Dell Chile. There were also instances of OEMs such as HP and Asus accidentally revealing 'Whiskey Lake-U'-powered laptops. Nevertheless, today is the day we get all the official scoop on these chips straight from the horse's mouth so let's check them out. 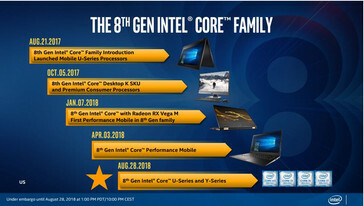 So far, the Intel 8th generation family includes CPUs such as the 15W 'Kaby Lake-R' and the 65W/95W 'Coffee Lake' that were launched last year along with this year's 65W/105W 'Kaby Lake-G' and the 45W 'Coffee Lake-H'. Now, 'Whiskey Lake-U' and 'Amber Lake-Y' will continue to be a part of the 8th generation with the former superseding 'Kaby Lake-R' as the 15W CPU of choice in notebooks and ultrabooks. 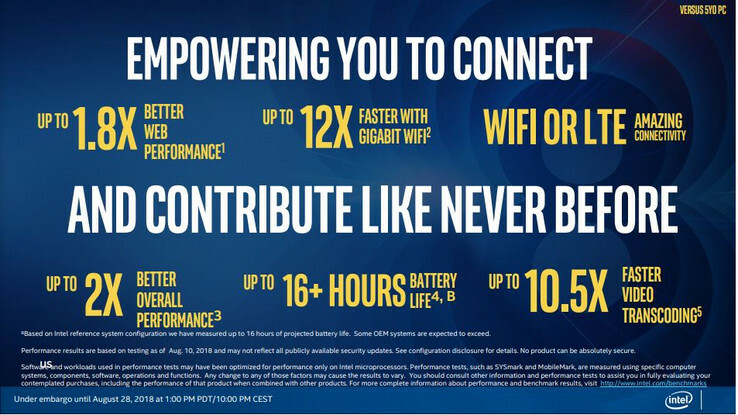 Intel touts overall improvements in the new chips concerning performance, connectivity, battery life, and in enabling more thinner form factors. While 'Whiskey Lake-U' is a 15W part, 'Amber Lake-Y' sports a 5W TDP, making it a good choice for fanless or passively cooled ultrabooks. 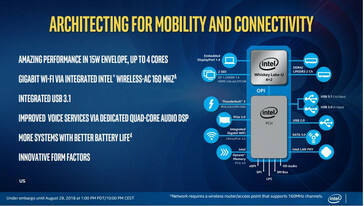 Intel dwelt on the architecture of the new CPUs ('Whiskey Lake-U', in particular) during the presentation. The new Whiskey Lake chips are based on the improved 14nm++ process but use the same architecture as Kaby Lake-R. While the Core i5-8265U and the Core i7-8565U feature 4 cores with Hyperthreading, the Core i3-8145U is a 2 core 4 thread part. Intel said that all 'Whiskey Lake-U' and 'Amber Lake-Y' SKUs sport the integrated Intel UHD Graphics 620 / 615, which provides HDMI 1.4 and DisplayPort 1.2 out at 4K 30Hz and 60 Hz respectively . The DisplayPort 1.2 path adds an integrated LSPCon that can convert the DisplayPort 1.2 signal to HDMI 2.0a while the embedded DisplayPort 1.4 path powers the notebook's internal display. The CPU supports dual-channel LPDDR3 2133 or DDR4 2400 RAM. In short, there are no major changes with the new chips as far as the iGPU is concerned. The PCH for Whiskey Lake though, is getting an upgrade and comes with (partly) integrated Intel Wireless-AC 160 MHz Gigabit Wi-Fi and USB 3.1 controllers thereby, freeing up some PCIe lanes for peripherals. There is Thunderbolt 3 support via a separate Alpine Ridge controller (although the diagram implies that it is part of the PCH) that should be quite useful for eGPU setups along with PCIe 3.0 lanes for discrete graphics and Intel Optane Memory. Apart from these, there are the usual SPI and eSPI interfaces for sensors and memory card readers, lanes for USB 2.0, 3.0, and 3.1 connectivity, HD Audio, SATA 3.0 etc. There's also a dedicated quad-core audio DSP for voice commands. This DSP works with Amazon Alexa and Microsoft Cortana even in an ultra-low power state. There are some obvious improvements to the new CPUs such as higher turbo clocks but Intel is comparing the performance of 'Whiskey Lake-U' with a 5-year old PC (read a Core i5-4200U with 4 GB DDR3 RAM). The company is touting 12x improvements in connectivity with longer battery life and enhanced productivity in popular apps such as Corel Painter 2019, Adobe Photoshop Lightroom CC, CyberLink PowerDirector, and Handbrake. As with most product launches, the numbers are only relative and we will have to test out the CPUs ourselves to determine how much exactly are we gaining with the new iteration. Intel told us that the new CPUs are built from the ground up to address the recent Spectre and Meltdown attacks and therefore, security will not be at the expense of performance unlike previous generation CPUs. Most specifications of 'Whiskey Lake-U' SKUs such as boost clocks and TDP remain unchanged from the corresponding ones in 'Kaby Lake-R'. However, we find that the turbo clocks have now gone up. We also see the inclusion of a Core i3-8145U in the 'Whiskey Lake-U' family. There was no Core i3 when 'Kaby Lake-R' was announced but Intel did introduce a new 2 core 4 thread Core i3-8130U SKU later on. Again, in this iteration, we see that the Core i3-8145U has the same specs as the i3-8130U save for the higher turbo speed at 3.9 GHz. The 'Amber Lake-Y' series follow a similar trend and sport higher turbo speeds within the same 5W TDP envelope and LPDDR3 1866 RAM support as 'Kaby Lake-Y' but the naming is more in line with other SKUs instead of something abstract such as a 7Y75, for example. This should enable more fanless and passively cooled notebooks, which don't suffer much on performance. 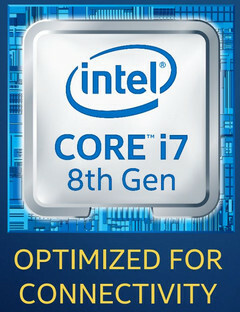 We asked Intel as to how does one know whether the notebook features a 'Kaby Lake-R' or a 'Whiskey Lake-U' chip given most OEMs just list them as 'Intel 8th generation CPUs' in their spec sheets, and their answer was to look for the 'Optimized for Connectivity' label beneath the CPU logo. We should be seeing laptops powered by 'Whiskey Lake-U' and 'Amber Lake-Y' make their mark during IFA 2018 and beyond so stay tuned for all those announcements and more.